On May 27th, the winner of the eighth annual Best Translated Book Awards was announced at Book Expo America. The winner for the fiction category - from a longlist of twenty-five titles was Can Xue's The Last Lover (translated from Chinese by Annelise Finegan Wasmoen). 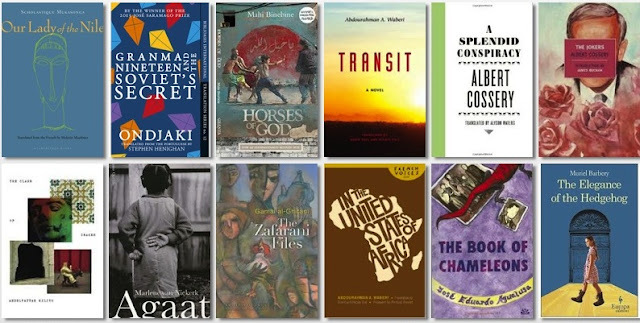 As explained on their website, the Best Translated Book Award is an American literary award launched by Three Percent in 2007 to bring attention to the best original works of international fiction and poetry published in the U.S. during the previous year. *I was unable to find the 2009 longlist and I didn't spot any on the 2012 list, and I may have also missed some out in the other years. I may have only been able to find 12, but from young women in an elite boarding school in Rwanda to suicide bombers in Morocco and a white woman and her black domestic worker in South Africa, the Best Translated Book Awards have a delightful selection of translated African fiction on their longlists. So why not give some of these works - from Angola, Djibouti, Egypt, Rwanda, Morocco, and South Africa - a try. Read on to find out more. By the beaches of Luanda, the Soviets are building a grand mausoleum in honour of the Comrade President. Granmas are whispering: houses, they say, will be exploded, and everyone will have to leave. With the help of his friends Charlita and Pi (whom everyone calls 3.14), and with assistance from Dr. Rafael KnockKnock, the Comrade Gas Jockey, the amorous Gudafretov, crazy Sea Foam, and a ghost, our young hero must decide exactly how much trouble he's willing to face to keep his Granma safe in Bishop's Beach. In her first novel, Our Lady of the Nile, originally published in 2012 by Gallimard, Rwandan Scholastique Mukasonga drops us into an elite Catholic boarding school for young women perched on the ridge of the Nile. Parents send their daughters to Our Lady of the Nile to be moulded into respectable citizens ... and to escape the dangers of the outside world. Fifteen years prior to the 1994 Rwandan genocide, we watch as these girls try on their parents' preconceptions and attitudes, transforming the lycee into a microcosm of the country's mounting racial tensions and violence. In the midst of the interminable rainy season, everything unfolds behind the closed doors of the school: friendship, curiosity, fear, deceit, prejudice, and persecution. With a masterful prose that is at once subtle and penetrating, Mukasonga captures a society hurtling toward horror. On May 16, 2003, fourteen suicide bombers launched a series of attacks throughout Casablanca. It was the deadliest attack in Morocco’s history. The bombers came from the shantytowns of Sidi Moumen, a poor suburb on the edge of a dump whose impoverished residents rarely if ever set foot in the cosmopolitan city at their doorstep. Mahi Binebine’s novel Horses of God follows four childhood friends growing up in Sidi Moumen as they make the life-changing decisions that will lead them to become Islamist martyrs. The seeds of fundamentalist martyrdom are sown in the dirt-poor lives of Yachine, Nabil, Fuad, and Ali, all raised in Sidi Moumen. The boys’ soccer team, The Stars of Sidi Moumen, is their main escape from the poverty, violence, and absence of hope that pervade their lives. When Yachine’s older brother Hamid falls under the spell of fundamentalist leader Abu Zoubeir, the attraction of a religion that offers discipline, purpose, and guidance to young men who have none of these things becomes too seductive to ignore. Narrated by Yachine from the afterlife, Horses of God portrays the sweet innocence of childhood and friendship as well as the challenges facing those with few opportunities for a better life. Binebine navigates the controversial situation with compassion, creating empathy for the boys, who believe they have no choice but to follow the path offered them. Summoned home to Egypt after a long European debauch (disguised as "study"), our hero Teymour - in the opening line of A Splendid Conspiracy - is feeling "as unlucky as a flea on a bald man's head." Poor Teymour sits in a provincial cafe, a far cry from his beloved Paris. Two old friends, however, rescue him. They applaud his phoney diploma as perfect in "a world where everything is false" and they draw him into their hedonistic rounds as gentlemen of leisure. Life, they explain, "while essentially pointless is extremely interesting." The small city may seem tedious, but there are women to seduce, powerful men to tease, and also strange events: rich notables are disappearing. Eyeing the machinations of our three pleasure seekers and nervous about the missing rich men, the authorities soon see - in complex schemes to bed young girls - signs of political conspiracies. The three young men, although mistaken for terrorists, enjoy freedom, wit, and romance. After all, though "not every man is capable of appreciating what is around him," the conspirators in pleasure certainly do. Who are the jokers? The jokers are the government, and the biggest joker of all is the governor, a bug-eyed, strutting, rapacious character of unequal incompetence who presides over the nameless Middle Eastern city where this effervescent comedy by Albert Cossery is set. The jokers are also revolutionaries, no less bumbling and no less infatuated with the trappings of power than the government they oppose. And the jokers are Karim, Omar, Heykal, Urfy, and their friends, free spirits who see the other jokers for the jokers they are and have cooked up a sophisticated and, most important, foolproof plan toenliven public life with a dash of subversive humour. The joke is on them all. Set in apartheid South Africa, Agaat portrays the unique, forty-year relationship between Milla, a sixty-seven-year-old white woman, and her black maidservant turned caretaker, Agaat. In 1950s South Africa, life for white farmers was full of promise - young and newly married, Milla raised a son and created her own farm out of swathe of Cape mountainside with Agaat by her side. By the 1990s, Milla's family has fallen apart, the country she knew is on the brink of huge change, and all she has left are memories and her proud, contrary, yet affectionate guardian. With haunting, lyrical prose, Marlene van Niekerk creates a story about love and loyalty. Renée Michel is the dumpy, nondescript, 54-year-old concierge of a small and exclusive Paris apartment building. Paloma Josse also lives in the building. Acutely intelligent, introspective and philosophical, this 12-year-old views the world as absurd and records her observations about it in her journal. These two characters provide the double narrative of The Elegance of the Hedgehog, and you will -- this is going to sound corny -- fall in love with both. Tender and satirical in its overall tone, yet most absorbing because of its reflections on the nature of beauty and art, the meaning of life and death. The intelligent Muriel Barbery has served readers well by giving us the gently satirical, exceptionally winning and inevitably bittersweet The Elegance of the Hedgehog.